Lotus is native to India, but now it has found its way into the entire south Asian continent. Its primary supply of Lotus seeds comes from china and Cambodia. Lotus seeds have been long used in medieval medicines. Seeds have proven to be so very effective in a variety of health conditions. It has now found its way into the new medicine world. Lotus seeds can be consumed cooked or even raw. They exist in white and brown peel layers. 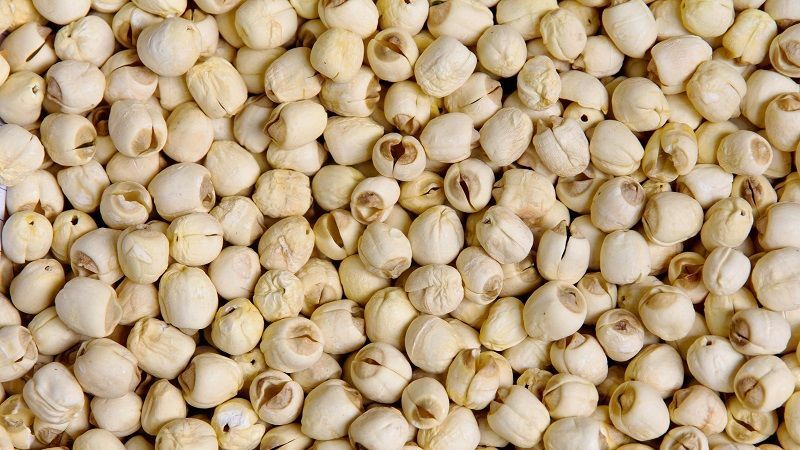 Sun dried lotus seeds are consumed by many Chinese food as a favorite snack item. Its great nutritional content makes it very popular as a healthy food item. The health benefits provided by the intake of Lotus seeds are provided below for your reference. The enzymes, which exist in Lotus seeds are supposed to inhibit aging. L-isoaspartyl methyltransferase is the enzyme that assists the repairing and maintaining of the damaged proteins within the body. Lotus seed in powdered form is now being added to various cosmetics to gain an advantage over the process of aging. Lotus seeds are supposed to have calming effects and are antispasmodic, which means, your nerves relax better and you get better sleep. It also helps the dilatation process of the blood vessels and helps you feel rejuvenated. This is thanks to the presence of isoquinoline alkaloids in Lotus seeds. Research has proved that Lotus seed helps in the cooling process of the heart and thereby reduces the pathogenic heat generated. People suffering with gum tissue related problems are recommended to consume Lotus seeds, because of the healing properties existing within Lotus seeds. Lotus seeds are supposed to be a great source of protein to the body. Doctors recommend this for intake to combat situations of protein deficiency within the body. Lotus seed is low on GI, which means it will slowly release the energy levels in your body, keeping you feeling energetic throughout the day. This will keep you far away from stress and even keep your mind healthy. Lotus seed contain abundant magnesium in it. Magnesium being the greatest channel blocker, improves the blood, oxygen and the flow of other nutrients. Low levels of magnesium can leave your body more prone to heart attacks. Such great is the content of Lotus seed that it leads to a dramatic difference of the heart condition. Its nutrition content of magnesium and folate brings down the risks associated with coronary heart diseases and other heart related conditions. The properties within Lotus seed have known to control chronic diarrhea. The astringent like properties in Lotus seed helps combating kidney related issues. Lotus seeds, as per some research, are also supposed to be a good remedy for general debilty. Since Lotus seeds are supposed to be low in glycemic index, it leaves you with a feeling of being full and even leads to weight loss. Lotus seed has the ability to handle and control this unnerving condition of insomnia on account of its naturally sedative effect. Lotus seed has high potassium content and traces of sodium, so lotus seed does its best in maintaining, stabilizing and even harmonizing the right blood pressure levels of the human body. The flavonoids content in Lotus seed is supposed to combat multiple health related issues. Kaempferol, which exists in natural state in Lotus seed, helps to prevent inflammation. Being great in fiber content, it helps keep your digestive tract in order. It helps to drive away all the bile, which comprises of cholesterol from the body and keep it clean. This means, your body cholesterol level is maintained. The high levels of potassium in Lotus seeds can be of great benefit to the heart. It can reduce the risks arising out of heart stroke or even hypertension. It leads to excess amount of sodium and water being flushed out of the system. It also aids in muscle contractions that lead to cramps. This essential micronutrient of extensive importance to the human body is available in an excellent proportion in Lotus seed. This nutrient is required by the body to maintain cognitive functions and the health of the nerves. Acetylcholine required for the purpose of neurotransmission can be generated via Lotus seed intake. Lotus seeds dosage can vary according to health conditions, age and other several factors. However, the general dosage of lotus seed powder is around 250 mg to 3 grams. Lotus seed allergy is possible in many people, so if you feel any symptom taking pumpkin seeds, consult your physician. Patients already on treatment should consult the physician before intake of Lotus seed. Diabetic patients already on insulin should consult the physician before intake of Lotus seed, since it tends to reduce the blood sugar levels. Intake of Lotus seed can cause flatulence, bloating and constipation. Apart from all these, nutrition health benefits that it provides, Lotus seed have also been used as an inductive in cosmetic products to promote anti-aging. Furthermore, Lotus seeds are a common snack, low in fat, sugar and carbohydrates, which mean snacking on them between meal times, will not promote weight gain. Its excellent content of nutrients and phytonutrients make it the reason to be in demand. It is widely exported from china to across the globe. It will take care of the primary nutrients required for your body. Snack on it at your free will, there is nothing to lose. In other words,lotus can be a drug. Then how to consume the lotus to maximum benefits for the body ?